June 12, 2016. One of the goals for our Italian vacation was to log several hours basking on a beach. Both to counteract the effects of Norway’s cool and cloudy spring (I am so over taking vitamin D tabs), and because we were in desperate need of down time after long, stressful weeks at work. 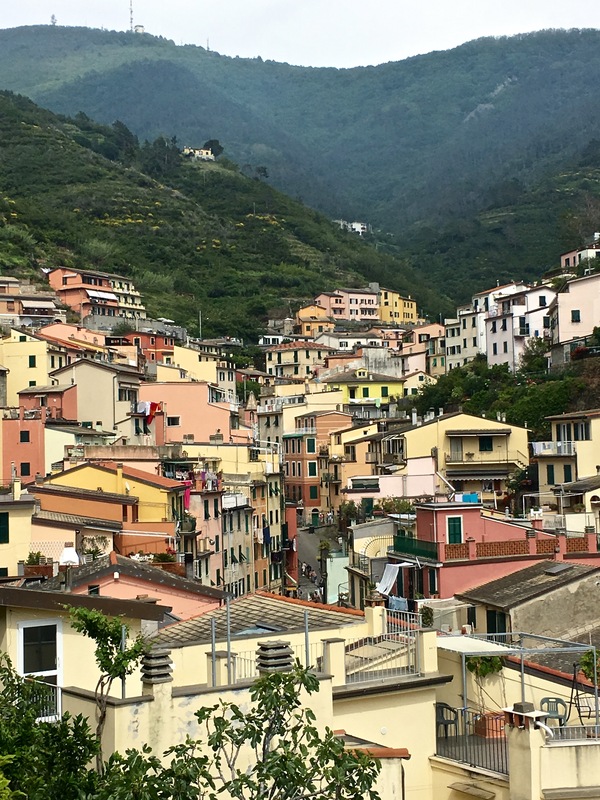 According to Rick Steves, Cinque Terre fit the bill, promising plentiful sunshine and few “sightseeing musts” that might otherwise tempt us away from our slothful mission. Terraced back in Roman times, the hillsides above each Cinque Terre town host extensive vineyards and olive groves. Probably most of you have already heard of this once-sleepy part of Italy, but just in case, here’s a brief recap of its history. The name Cinque Terre means “five lands” and refers to five little villages that cling to the Italian Riviera’s fjord-ish ravines like limpets on a rock. Most of the towns have Roman roots, but they really got their foothold during the Medieval era by providing wines, olive oil, and fish for their feudal overlords. 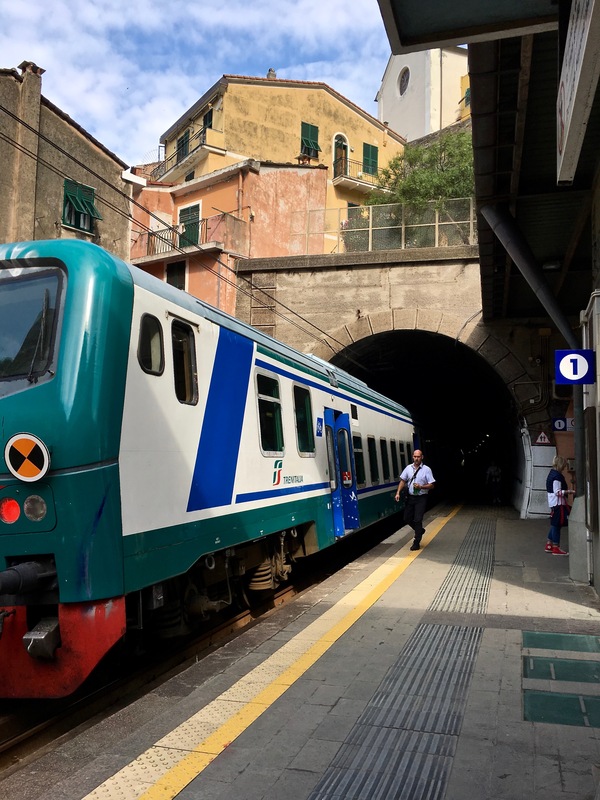 Car traffic is restricted throughout the Cinque Terre, but a small train line services all five towns. Beware, however; the schedule becomes increasingly delayed throughout the day, as it can take ten minutes or more per stop to stuff the cars with tourists, like anchovies in a tin can. While agricultural products are still primo exports today, tourism has taken over. Millions of visitors come every year to check out the colorful panoply of picturesque buildings that seem to tumble down the cliffsides and spill out into the sea. Even better, the villages give the appearance of isolation, since they’re best reached by boat or by interconnecting footpaths just perfect for a day-hike. 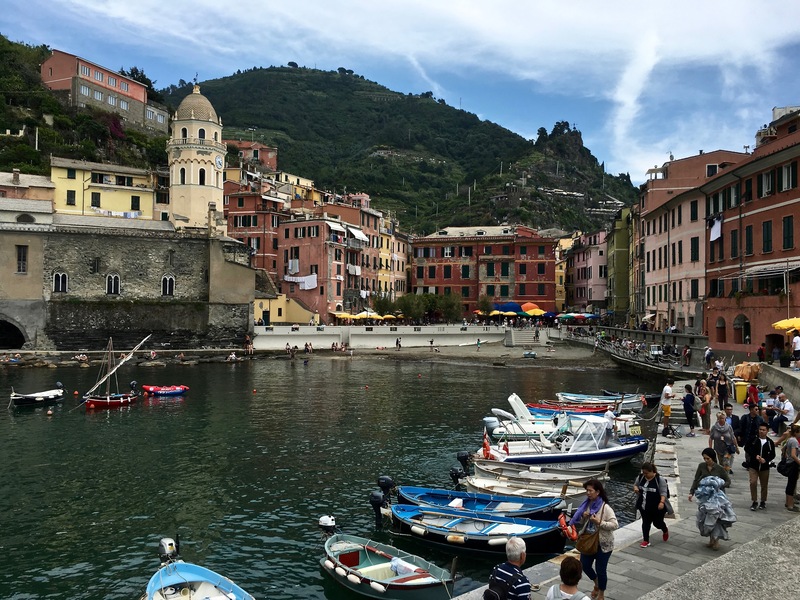 Vernazza has the only natural harbor, which is dotted with cute fishing boats and a few tiny tourist cruisers. The other towns have more creative strategies for accessing the sea. Trekking from beach to beach seemed like a great way to work off all the liquid calories that we intended to consume while lying around soaking in the sunshine. (Hello, my new friend, Aperol spritz!) So we picked Vernazza, the central town, as our home base. Our plan was to start each morning with a hike, catch lunch along the coastline, spend the afternoon on the shore, explore a new town each evening, and take the train back to our hotel at night. I’m eager to down some Pastis and dive into a plateful of the local delicacy — toast covered with fresh “acchiughe” (anchovies). Upon our arrival, we made a beeline for the harbor cafés, where we staked out a table and ordered glasses of Pastis to wet our parched throats. After watching kids play on a tiny spit of boat-dock sand for awhile, we meandered upwards through town, popping our heads into the local Gothic church and checking out little grottos where cute shops and art galleries took shelter from the sun. As we’d witnessed during our honeymoon many years ago, the entire coastline of Italy is dotted with brooding stone towers built during the Middle Ages to keep watch for invading Turks. Eventually we found the steep, winding pathway that led to Castle Doria, a grand name for a simple stone tower that stands out on a promontory above the town. Long ago, it was one in a string of Medieval watchtowers intended as an early-warning system for approaching Saracen pirates. Later it served sentry as a Nazi lookout. Today, it provides a great viewpoint over Vernazza and the gorgeous Mediterranean. 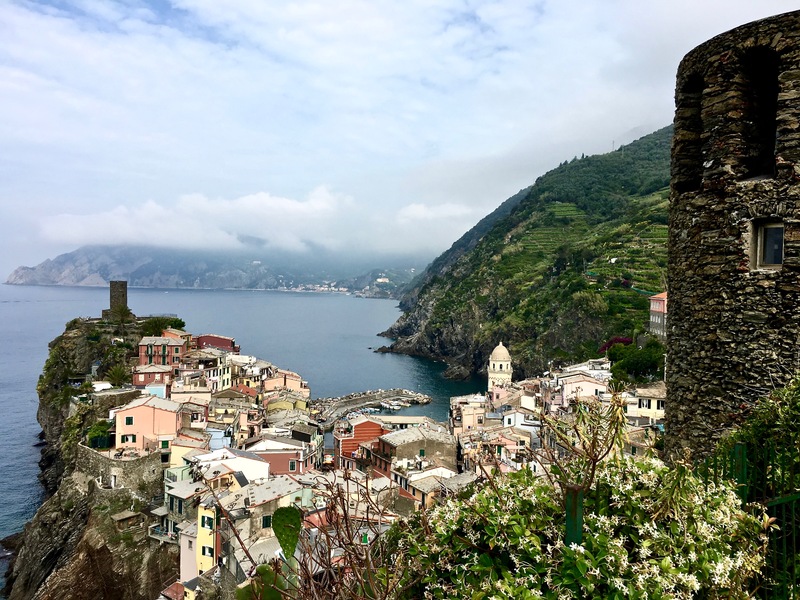 We snapped this shot of peaceful Vernazza from the trail leading to Monterosso al Mare, which is the northernmost of the five towns. Cinque Terre sits at the south end of Liguria, a coastal region headed by the city of Genoa. 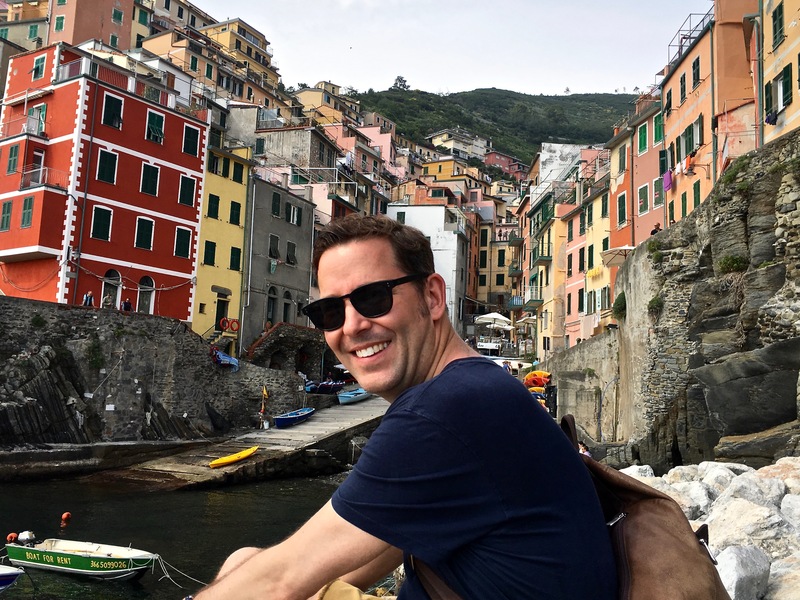 The district government appoints a “commissioner of good taste” who regulates the Ligurian Pastel colors of Cinque Terre’s buildings. Brightly painted doors stand out agains the pastel buildings. The whole town looks like an artist constructed it. A breakwater protects Vernazza’s natural harbor and a tiny stretch of sand that acts as a boat launch and kiddie play pool. But during winter, the sea can be so rough that waves can come crashing over the breakwater, flooding the harbor area and carrying away unsuspecting bystanders. Fisherman make a living supplying the day’s catch to restaurants, who pride themselves on their “antipasti ai frutti di mare” (fruit of the sea, prepared like a ceviche — unbelievable!) You can also book one of the town’s small tour boats for an afternoon cruise along the five coastal villages. Matthew’s been addicted to the “sport” of foosball since college, and in practically every country we visit, he always looks for some poor, unsuspecting victim he can challenge to a match. He’s like a Border Collie with a ball — he simply can’t be distracted; he plays as if his life depends upon it; and he rarely loses. It’s a wonder we haven’t yet been embroiled in a bar fight (although we’ve come close.) One evening we joined in a game with an American family, and I had to remind him that a victory against children wouldn’t really be something to brag about. 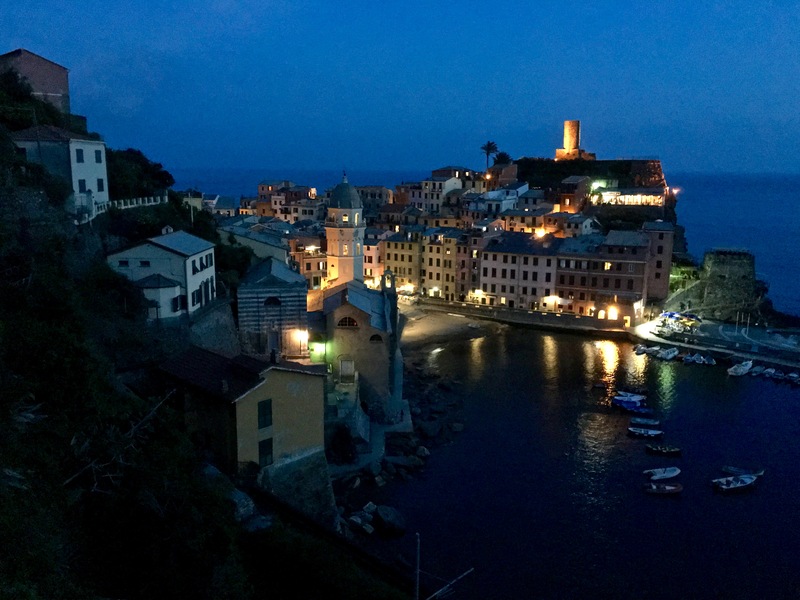 Built in 1318 and enlarged in the 16th century, Vernazza’s simple Ligurian Gothic church is characteristically made of black stone hauled from the top of the mountain above. The church has a bit of an awkward entrance — as we learned when we accidentally popped in during the middle of a service and found ourselves next to the altar, facing the congregation. A stair-stepped coastline wreathed in clouds is standard fare from any vantage point along the Cinque Terre. Check out the breathtaking view from the delicious Ristorante Belforte, which is situated in the lower part of the old castle. Vineyards, olive trees, lemon groves, and postcard vistas greeted us all along the trail to Corniglia. 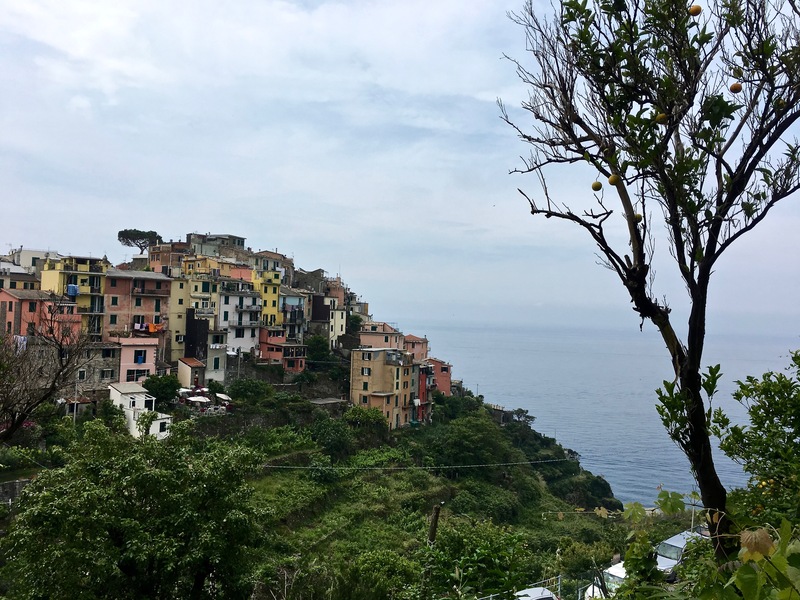 We set off early the following morning for a two-hour trek to Corniglia, a workaday town just south of Vernazza in the Cinque Terre chain of villages. The initial climb up out of Vernazza and to the main trail-line proved pantingly steep, but the heady smell of wildflowers and pine trees heated by the sun made all the sweatiness worth it. Eventually the path leveled out, and better views of the sparkling Mediterranean kept unfolding around each bend. By the time we reached Corniglia, we were ready for that seaside dip, but no such luck. It’s the only one of the five towns not on the ocean. Strike two. Instead, it perches high above on a hilltop, leaving fishermen to hoist their boats down into the water far below. So we contented ourselves with touring the bewitching little town and grabbing a delicious lunch at La Lanterna, where we had to fight the restaurant’s resident tomcat for a seat at the only remaining table. The pathways that link the Cinque Terre towns have been around for centuries, but the whole trail system became the Cinque Terre National Marine Park in 1999. A small trail fee supports maintenance of the paths, which in general are quite easy to follow and not difficult to hike if you’re in reasonable shape. Lots of pretty Common Wall Lizards (Podarcis muralis) came out to sun themselves on the pathways. Fun fact: females of this species test the air with their tongues to tell which male has the highest testosterone count. Corniglia is well-known for its wines, and we passed lots of rock-walled fences enclosing grape arbors. The area’s specialty is a sweet dessert wine, called Sciacchetrà, which means “push and pull” in the local dialect. Since the stuff is made from grapes left long on the vine and shriveled almost to raisins, it requires pushing a lot of grapes into the press to pull out the best wine. The aged variety can be quite pricey and is seriously alcoholic — 18 percent versus the 11 percent of normal wine. Most of the surrounding hills hold terraced vineyards supported by “muri a secco” — drystone (mortarless) walls. Traditionally, land is subdivided amongst all family members from generation to generation. Some of these plots have become so small that they’re no longer profitable, meaning they’re no longer maintained. Lack of vineyard maintenance is one reason why flash floods and landslides have become so problematic lately. Well-kept rock walls and the roots of healthy vines help prevent runoff and soil erosion. Check out this odd one-man train that the vintners use to reach their fields. The rail rides up along the terraces, from the farms to the mountaintop. Corniglia’s pretty Chiesa di San Pietro (Church of Saint Peter) was built in 1334 in classic Gothic Ligurian style. Although rather plain on the outside, the inside is stunningly grand. Check out St. Peter’s gorgeous Baroque interior festooned with frescoes and marble details. It’s surprisingly ornate and lavish for such a small town, and it’s easily the fanciest of all the Cinque Terre churches we visited. The main square of Corniglia. I’m perched at one of the outdoor tables (chick with the hat, bottom left) of La Laterna. Try their delicious pansotti, a ravioli with walnut sauce — to die for! La Laterna’s tomcat, named Michelou, had spent the night carousing. He wasn’t about to give up his seat — or interrupt his catnap — to let us share his table-side bench. Until our fish arrived. Suddenly, we became absolutely fascinating. If you squint, you can see the rock-strewn, cliffside trail we would have taken to Riomaggiore had the landslide not occurred. Beautiful view, though. 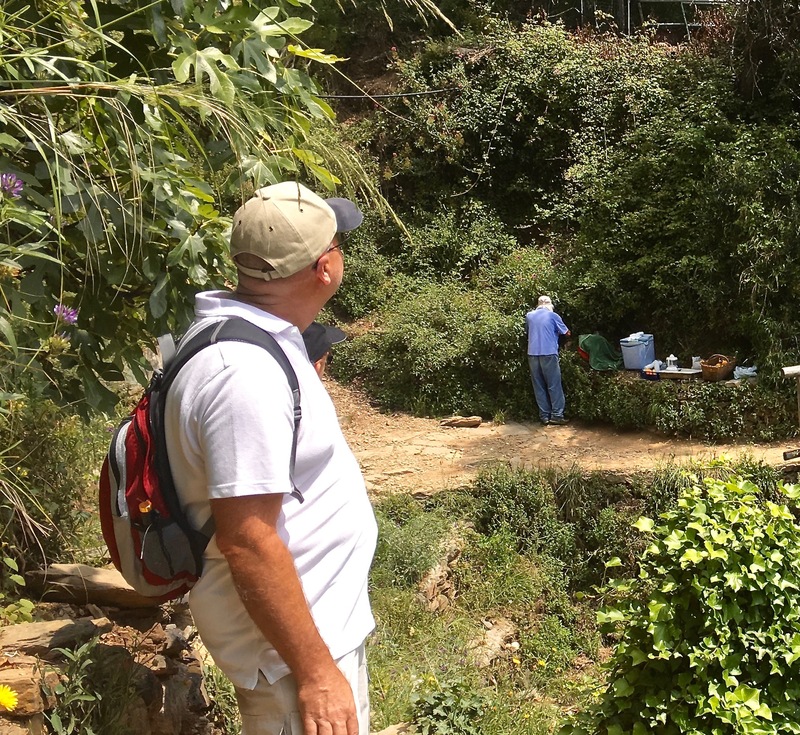 After our lunch in Corniglia, we’d planned to hike our way to the next town, but unfortunately, a recent landslide had closed the trail. Instead, we took the insanely steep staircase down to the depot platform, where we waited more than an hour for the next train. By now we were rather desperate for a dip in the ocean and a nap on the shore, so we headed straight to Riomaggiore’s beach. Just as Rick Steves’ had warned us, it was made up of football-sized rocks. We took some time to reorganize the boulders into something slightly less likely to cause chiropractic issues, then headed down to the water. Ice cold. And impossible to wade in because the boulder formations were covered with an odd mixture of sharp mussels and slick seaweed. Plus, a brisk wind had sprung up, and dark clouds loomed above the mountaintop. We settled for huddling beneath a blanket for a short siesta, then we toddled back to town before the monsoon broke. To be fair, I guess we’d call this beach moment more of a foul ball than a strike …. Though manmade, Riomaggiore’s harbor is still picturesque. (Click on the photo to see it up close.) When they know a storm is coming, fishermen work together to roll the boats up the steep launch ramp and into town. The brief squall blew itself out fairly quickly, giving us time for a short walk through the charming village. 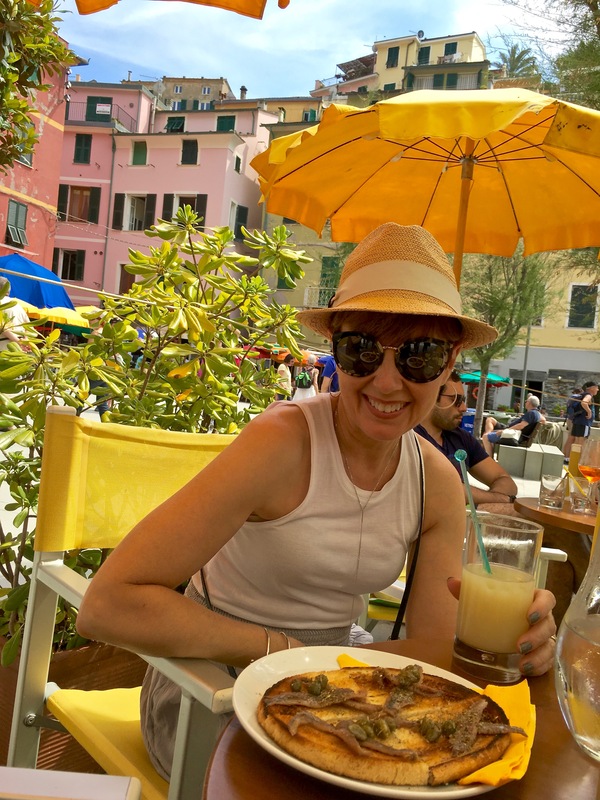 We snacked our way down the street, sampling local specialties like focaccia, farinata, and seafood caught fresh that morning by Edoardo and fried up by his wife, Laura, at Il Pescato Cucinato. While we ate, we watched local kids cliff dive into the chilly harbor waters and come up screaming from the cold. And we got a chance to admire quaint little fishing boats that had been hauled up and onto the town streets in advance of the storm. Definitely a place to kick back and watch how daily life unfolds for folks lucky enough to have been born along the Italian coat. Three villages down so far, two more to go, and each as alluring as the next. Homes in Riomaggiore and elsewhere in the Cinque Terre are typically narrow, Medieval townhouses called “case torri.” They’re stacked into parallel rows, with the main front door facing the lower street and a back door that leads to a higher-level rear alley that once acted as an escape hatch in times of attack. Their festive colors really bring out a feeling of the tropics, despite their Medieval history. Only the young are brave enough to dive from the steep harborside cliffs. If you look closely, you can see the pathway we would have taken into Riomaggiore from Manarola had the landslide not occurred. It’s a true cliffhanger. Check out the stairway to the train platform. Called the ‘Lardarina,” it consists of 33 flights totaling 377 steps. So glad we decided not to hike in the opposite direction, or we would’ve had to climb up these stairs, rather than march down them. The pretty church interior contains a wooden crucifix that, on Corpus Domini (six days after Easter), gets carried down to the harbor for a service. The black-and-white-striped lancet arches are typical for Ligurian Gothic architecture. Evocative narrow alleyways snake between towering houses, the walls of which are supported via arches spanning the narrow lanes. Or how about topping off the fried fish with a slice of farinata — a fried chickpea bread? The fishermen’s boats are small but quite pretty. One guy told us that the color blue was considered good luck and would protect sailors. Il Pescato Cucinato offered us a paper cone of freshly caught-n-fried seafood and a beer; what’s a better way to end the day? Or you can also make a meal of slices of focaccia — the stuff was supposedly invented in Liguria, the region in which the Cinque Terre is located. 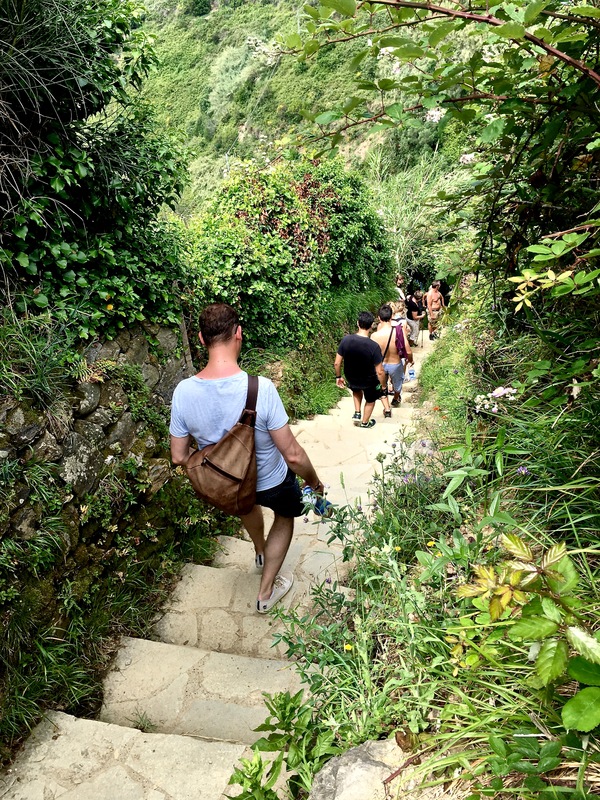 Matthew joins the end of the line on a death march down one of the many steep staircases we encountered on the trek to Monterosso al Mare. 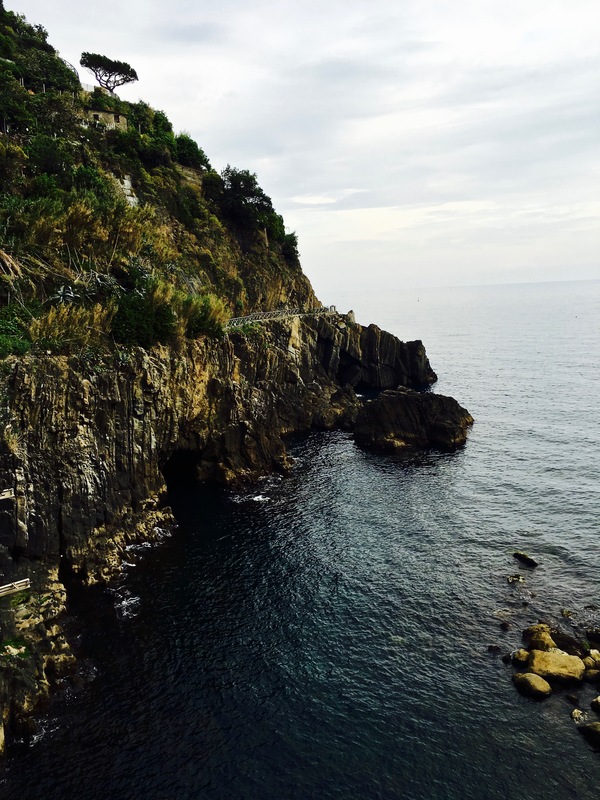 Our last full day in Cinque Terre gave us one final shot at summertime fun … we hoped. We hit the northward trail to Monterosso al Mare early, since the day promised to be a warm one. Humpback bridges, riotous wildflowers, and jaw-dropping panoramas of seaside cliffs kept us motivated as we meandered along the two-mile trail. More rugged than yesterday’s hike, the path climbed up and down sharply, making me wish I’d worn something other than my Birkenstocks. Huge groups of sweating, cursing tourists — most of whom were clearly not in suitable shape for such a strenuous adventure — clogged the path, forcing us to step aside so the long chain gangs could pass. This confused tourist has a WTF moment, wondering if he’s hallucinating the dude who’s minding his lemonade stand along the steep trail. At one point, a rallying cry went through the crowds and word began to spread, “There’s a lemonade stand around the next bend!” Surely a mirage caused by the sultry heat. But no, an entrepreneurial gent had set up a table beneath the shade of an oak tree and was busily squeezing lemons into a pitcher. And as if that wasn’t enough encouragement, about a half-mile later, a gypsy band comprised of a fiddler, guitarist, and an accordion-player serenaded the herds in hopes that hikers might lighten their backpacks by a few coins. Wiser hikers than we brought rain gear with them in preparation for the deluge. But of course, just as we reached the edge of town, a torrential downpour let loose, giving us barely enough time to reach shelter beneath the umbrellas of the closest restaurant. We sat there for almost three hours, staring forlornly at drenched beach chairs and runnels in the sand (yes, real sand, not rocks!!!) created by the raging runoff. Strike three, we’re out. We watched our last chance at some tan lines recede into the distance, along with the setting sun. The rain eventually relented just long enough for us to take a late-afternoon tour of the photogenic town before we headed back to our hotel to dry off. 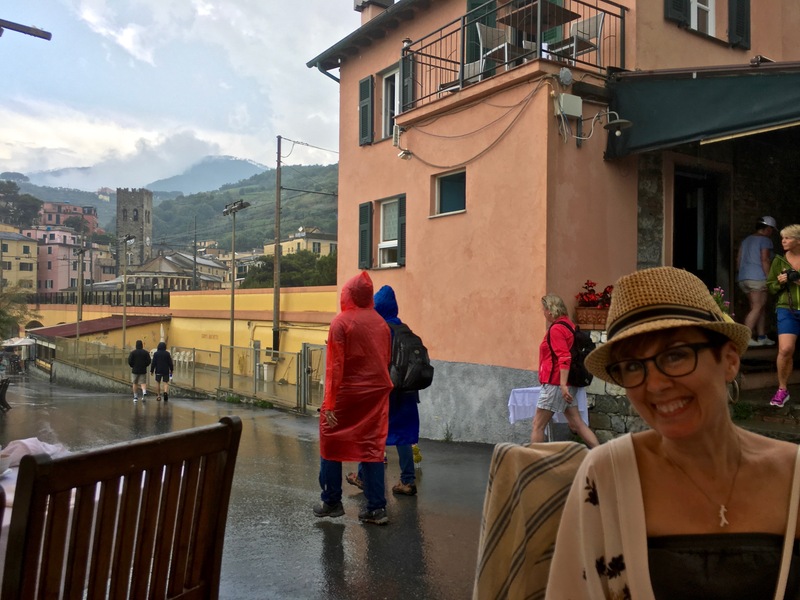 Note to self: next time we visit Cinque Terre, schedule a full week to allow ample hours for hiking, sunning, rain showers, and simply soaking in the ambience of the atmospheric towns and vast seaside vistas. Love this adorable hump-backed bridge along the trail to Monterosso al Mare! A beautiful Red Admiral (Vanessa atalanta) butterfly takes a drink from a Butterfly Bush (Buddleia). Stunning views of the coastline abound along the way to the next town and reveal the lovely azure color of the sea. 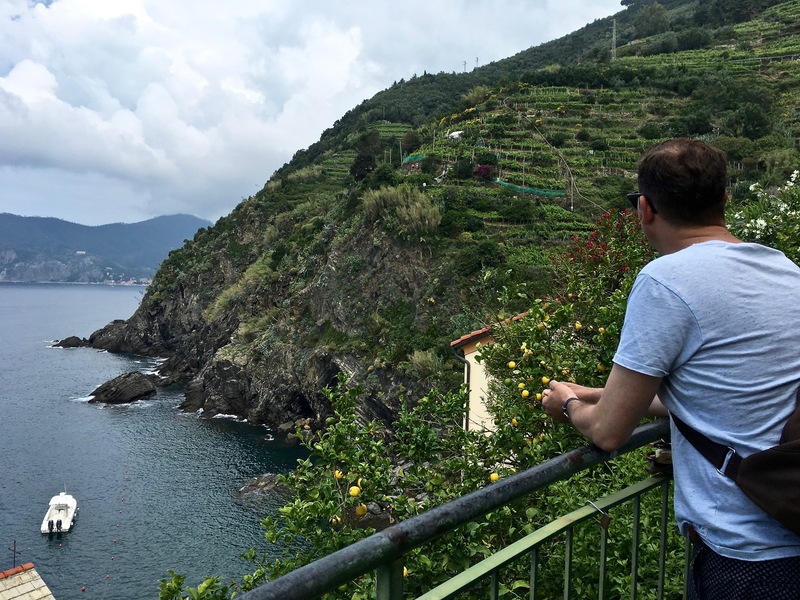 More gorgeous vineyards, and a peep at Monterosso al Mare beyond. As we headed out on our hike, we looked back to see this picturesque view of a church steeple. Passing by a farmer’s field, we saw this Blue Passionflower (Passiflora caerulea) being tended to by a bee. Many of the grocers in town carried passionfruit as picnic fare. It can’t have been easy to have toted an accordion along the steep trail. Grapefruit-sized lemons caution that they’re not for sale, as they’ll soon become granita — a slushier form of what we call “Italian ice” back in the States. Thankfully, a guardrail keeps things safe, since the dropoff here is a few hundred feet. Great for acrophobics like me. The sun peeks out for a few minutes at the end of the day to light up the dreamy little town. Monterosso is the most “resort-y” of all the Cinque Terre towns. It has a sandy beach instead of rocks, for a change of pace. You’ll have to pay for the beach chairs and umbrellas, but it’s worth it for a seaside view and easy access into the water. An irridescent Musk Beetle (Aromia moschata) forages on wild carrot (Queen Anne’s lace / Daucus carota) growing along the trail. From the hilltop above Manarola, you can see three other Cinque Terre towns. 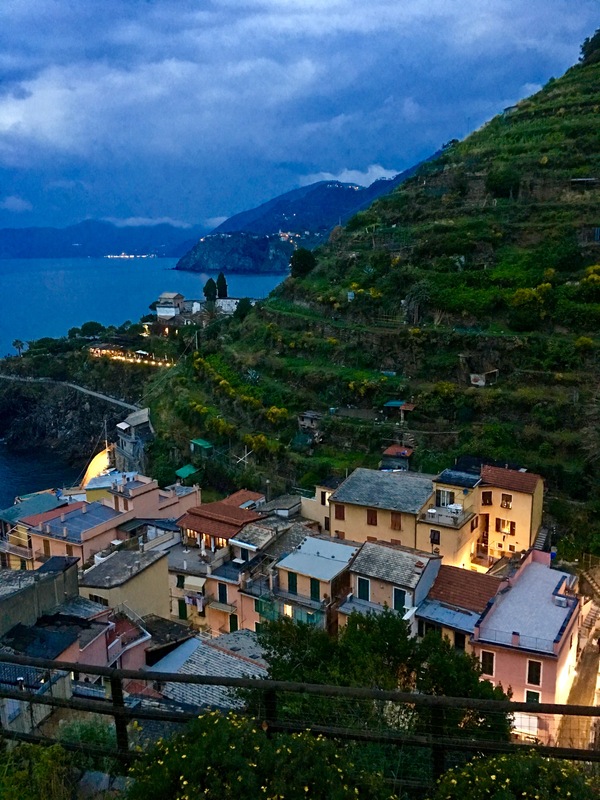 That evening, we boarded the train for nearby Manarola, the last of the five coastal sites. A light drizzle continued as we explored the sleepy village. The place seemed almost deserted, but in the dim light, we passed by rustic fountains, a few kids playing soccer in the churchyard, an ancient waterwheel, and the fleet of small fishing boats hauled up and into the streets to protect them from another oncoming storm — enough charm to make us decide that this peaceful place would be home base for our next Cinque Terre trip. We finished the night sitting harbor-side with a group of photography students as they tried to capture the incredible lightening storm out at sea. And we decided that even without sunburns and a markedly increased freckle count, we’d have still selected to spend our vacation in Cinque Terre. Supposedly the name Manarola means “waterwheel” in the ancient local dialect. As you can see, the town is built along an old river that used to cascade down from the mountaintop. Today, the river still runs beneath the main road. I’m crazy for the scent of Jasmine, which grows up the sides of buildings all over Italy. It covered the cabana where we stayed in Priano during our honeymoon, and ever since, I associate the smell with our wedding. Check out this sweet little street fountain from the 1800s. The sky over Manarola shows the fading flash of a bolt of lightening leftover from the storm out at sea. Hope your next visit there will be sunnier, as ours was in 2005. There are also some other good walks you can do to extend your trip there (e.g. Near Santa Margharita, you can hike down to Portofino, among other destinations. Boat trips are pleasant along the coast,too. And at other end (Riomaggiore and Portovenire) ,the island of Palmaria (?sp. )has nice hikes, with tiny native orchids when we were there in May. Isn’t It beautiful hiking through the terraced vineyards and olive groves, looking down on the deep cerulean of the Mediterranean? 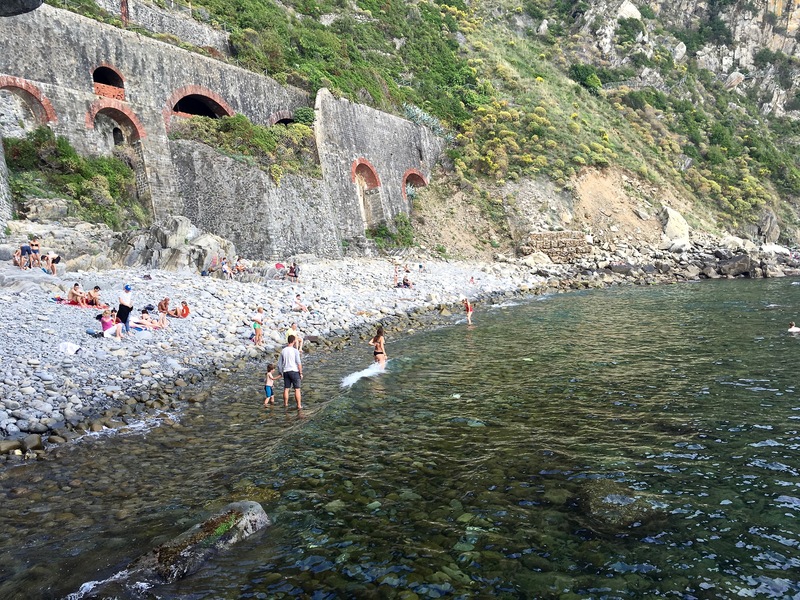 The Cinque Terre is indeed not the best place for swimming beaches, but surely is a visual and other-sensory treat ! Also it serves some of the best seafood cuisine I’ve had any place in the world. So sorry, I somehow missed the ping that you’d left a comment. Yes, the food was awesome, and the wine was equally fabulous. I’m making notes of your suggestions on other locales, as we hope to take some time off in October — we’re both in need of more sunshine before we head into the dark months here. We’re also maybe thinking Malta — have you been there? If so, any recommendations? It’ll be our first time, and there’s no Rick Steves’ Guide to give us a preview. What will I do without Rick as our pocket tagalong? They are amazingly comfy and surprisingly great for hiking! I’ve got plantar fasciitis in one foot, and they’re the only thing that I can walk in when it’s acting up. Otherwise, I’d be on crutches. Not so cute, though, but super popular as a fashion statement in Europe right now.